Example has said Alexandra Burke helped boost sales of his new single by feuding with him on Twitter. The Bad Boys singer took offence when the Changed The Way You Kiss Me rapper - real name Elliot Gleave - joked 22-year-old Alexandra was actually 41. Example told Daybreak: "I just like having little fun digs at people, I've got nothing against her personally, she seems like a perfectly lovely girl." He went on: "It's clear she's not 41, everyone knows she's not 41, but she took the bait, went nuts at me, called me all sorts of horrible things, and then I ended up in the papers every day for a week whilst my single was out. So great, thanks - Alexandra helped me stay relevant." 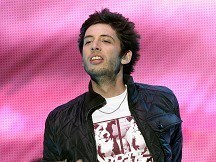 Example had tweeted on his 29th birthday on June 20: "29 is my real age by the way. My PR age is 24. Everyone has a different age for the media. Alexandra Burke is actually 41." But Alexandra didn't see the funny side and hit back with a string of angry insults. Lady Gaga has described a lawsuit which claims she is misleading her fans by seeking donations for victims of the Japanese earthquake as "misguided" and "without merit". Chart hopefuls Brother have had to change their name to avoid a legal row - after being served with a writ on stage. Paul Simon has postponed a London show tonight after doctors told him to rest his voice due to a throat infection. Alicia Keys is following Jay-Z and Will Smith into the world of Broadway producers.The singer, whose hits include Fallin' and A Woman's Worth, will help produce the play Stick Fly. Kate Moss discovered even being a famous supermodel doesn't guarantee A-list treatment at Glastonbury.